The third and final day of the Judo Grand Slam, Tokyo 2013, attracted a 10,000 capacity crowd as Japan starred at the Tokyo Metropolitan Gymnasium on Sunday. The women’s -78kg and +78kg categories were in action along with the men’s -90kg, -100kg and +100kg categories as Japan started the day with nine gold medals from nine categories. Hosts Japan entered the final day of the competition with nine gold medals from nine categories with the unthinkable chance of a potential clean sweep. Japan won 10 gold medals out of a possible 14 last year and went one better this year as they won two gold medals on the final day. Japan, who won 27 medals in total, were followed in the medal table by South Korea and the Netherlands who both won a gold medal today. World number six Marhinde VERKERK (NED) defeated World Judo Masters bronze medallist JEONG Gyeong-Mi (KOR) to win -78kg gold in Japan. 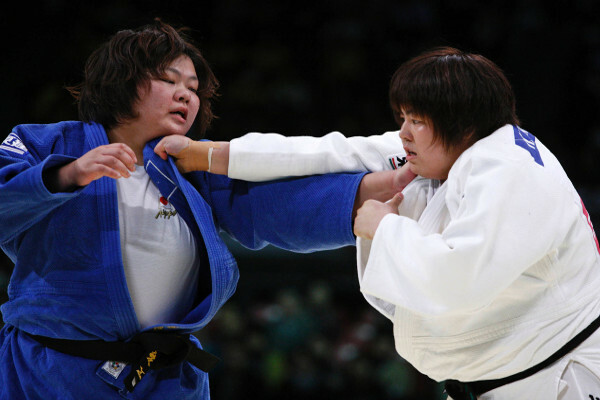 Asian Championships winner JEONG was caught with a sasae-tsurikomi-ashi for a waza-ari score after 75 seconds. JEONG received back-to-back shido penalties for passivity before Dutch star VERKERK was reprimanded with a shido for a false attack but that was insignificant as the first score proved decisive. VERKERK ensured Japan would not have interest in the -78kg category as former Asian Championships bronze medallist OKAMURA Tomomi (JPN) suffered defeat on shido penalties after three indiscretions while her opponent was only penalised once. 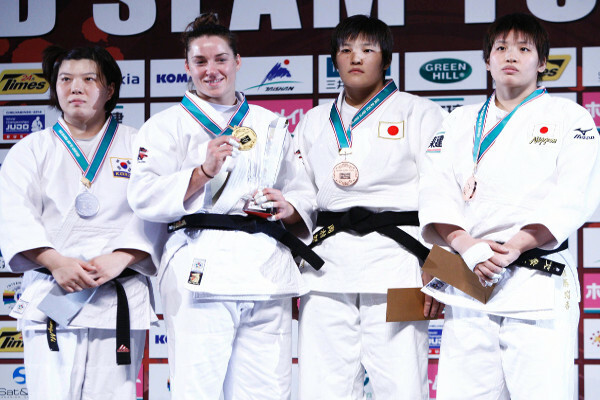 JEONG sealed her place in the final and denied the hosts a -78kg finalist when All Japan Judo Championships winner SATO Ruika (JPN) received four shido penalties to be disqualified with hansoku-make. The first bronze medal was won by OKAMURA who was awarded victory over world number 10 Luise MALZAHN (GER) after the European judoka received hansoku-make for inadvertently poking the eye of her opponent. The second bronze medal contest produced the same result as home judoka SATO bested Olympic silver medallist Kerstin THIELE (GER) in a bruising encounter. The German fighter scored first as a ko-uchi-gari after 30 seconds earned her a yuko. 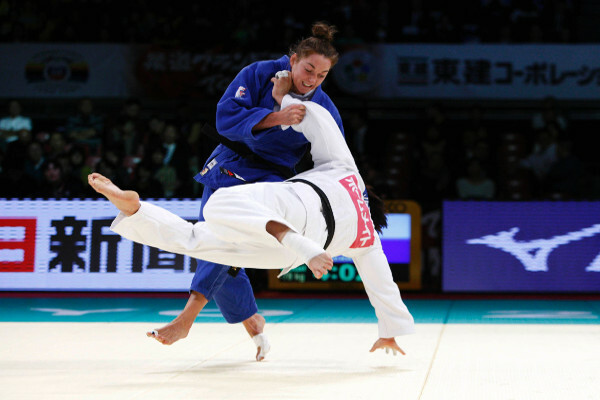 THIELE was penalised twice for passivity and, with a minute remaining, SATO surged into action and trapped her rival with a mune-gatame for ippon. Three-time World Championships bronze medallist TACHIMOTO Megumi (JPN) bested Moscow Grand Slam silver medallist YAMABE Kanae (JPN) to win Japan’s 11th and last gold medal medal of the competition. Both judoka were penalised after 30 seconds with shido penalties for passivity before TACHIMOTO was at fault moments later for the same offence. YAMABE was unable to capitalise and, with the contest failing to ignite, was penalised with two shido penalties which was one more than TACHIMOTO after the five minutes elapsed. TACHIMITO booked her place in the final with victory over her 17-year-old compatriot ASAHINA Sara (JPN). The contest failed to spark anything of note as they cancelled each other out for the five minutes with two shido penalties against ASAHINA – one more than TACHIMOTO picked up – separating the judoka. In the second semi-final YAMABE defeated world and Olympic champion ORTIZ as the Cuban was penalised four times for passivity to receive hansoku-make and drop into the repechage. The first bronze medal was won by three-time World Championships silver medallist QIN Qian (CHN) against home fighter and losing semi-finalist ASAHINA. 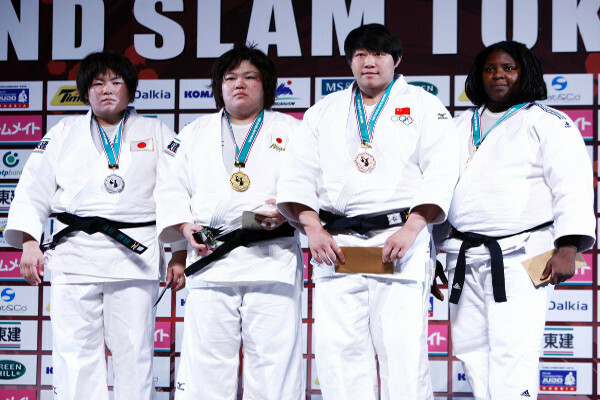 After a frantic exchange where both judoka looked to impose themselves the contest settled and QIN emerged with the medal after scoring a yuko with a harai-makikomi and following into osaekomi-waza as ASAHINA conceded the contest by submitting. The second bronze medal was clinched by ORTIZ who bounced back with a win over Qingdao Grand Prix silver medallist MA Sisi (CHN). The Chinese fighter pressed for an opening but ORTIZ reacted well to step off an uchi-mata attempt and MA was reprimanded with two successive shido penalties for passivity before the Cuban showed her class with a morote-eri-seoi-nage earning ippon with 32 seconds left. ORTIZ received a great ovation as the fans appreciated the defiant performance of the Olympic and world champion. 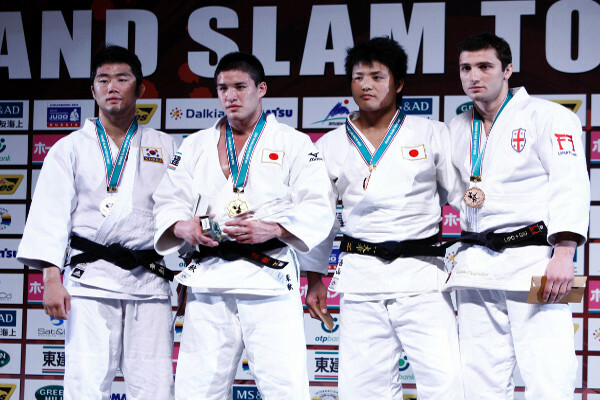 Unknown BEIKER Masyu (JPN) upset 2012 Tokyo Grand Slam winner LEE Kyu-Won (KOR) to win -90kg gold in front of a capacity crowd. BEIKER and LEE both received a shido for going out of the area after 40 seconds before the South Korean was penalised with a shido for a false attack. After BEIKER received a shido for passivity to restore parity, LEE turned out of a ouchi-gari attempt at the halfway point only for the Japanese tyro to throw him from the floor with a uchi-mata for a yuko score. BEIKER booked his place in the gold medal contest by stunning top seed and World Championships silver medallist Varlam LIPARTELIANI (GEO) in their semi-final. The Japanese newcomer scored a yuko from an uchi-mata after two minutes and added a waza-ari at the halfway mark from an ouchi-gari. There was no way back for World Team Championships gold medallist LIPARTELIANI who led after 15 seconds with a waza-ari score. In the second semi-final LEE blocked the passage of two-time World Championships runner-up NISHIYAMA Daiki (JPN) who had hoped to set up an all-Japanese final. LEE went in front from a waza-ari and NISHIYAMA was penalised with a shido for a false attack. Both judoka earned shido penalties for passivity before the Japanese fighter scored a waza-ari from a driving ouchi-gari which forcefully floored LEE. Shido penalties were the difference after five minutes as NISHIYAMA had accumulated two which was one more than his rival. 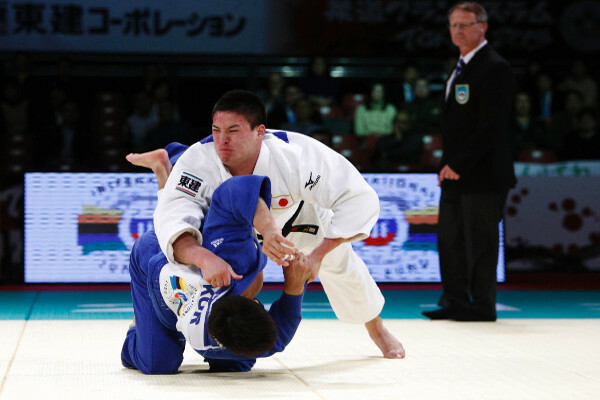 The first bronze medal was won by NISHIYAMA who subdued Qingdao Grand Prix bronze medallist Aaron HILDEBRAND (GER) with two ko-soto-gari sweeps. The second bronze medal was captured by LIPARTELIANI who let out this frustration from his semi-final defeat by dominating Asian Championships winner SHIMOWADA Shohei (JPN). SHIMOWADA, who won bronze at the 2012 Tokyo Grand Slam, was thrown for a waza-ari after 20 seconds and LIPARTELIANI maintained the same pressure until he threw the Japanese fighter with a hane-goshi for ippon after just one minute of explosive action. World number three and European champion Lukas KRPALEK (CZE) narrowly defeated Junior World Championships gold medallist Kyle REYES (CAN) in an engrossing -100kg final. KRPALEK, who had been penalised twice for passivity, scored a yuko with a minute remaining from a sumi-gaeshi. 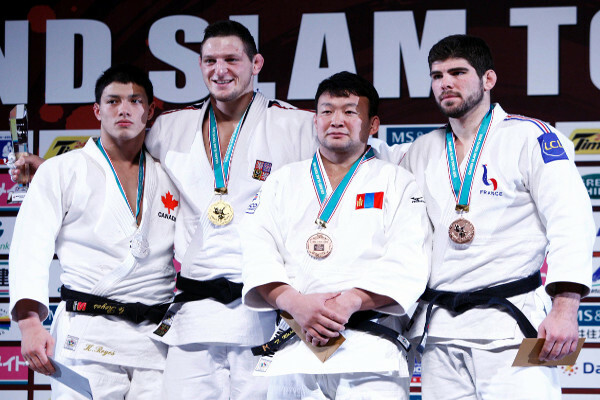 Canadian starlet REYES, who lives and trains in Japan, was determined to improve on his fifth place from the 2012 Tokyo Grand Slam and will be pleased with his battling performance which earned him a richly-deserved silver medal. KRPALEK sealed a place in the final by outlasting Abu Dhabi Grand Prix silver medallist Martin PACEK (SWE). They traded shido penalties throughout the five minute contest and it finished with two against KRPALEK and three against PACEK. In the second semi-final REYES come of age against former world champion Maxim RAKOV (KAZ) as the 20-year-old scored a yuko with 29 seconds remaining with an uchi-mata to separate the rivals at the end of the contest. The first bronze medal was won by 2008 Olympic champion NAIDAN Tuvshinbayar (MGL) who inflicted a second straight defeat for RAKOV. With a minute left and no scores registered NAIDAN showed his experience with an opportunistic counter as he felt that the Kazakhstan judoka was off balance from an uchi-mata attempt and powered him backwards with his upper body strength for a waza-ari. The second medal was won by World Judo Masters bronze medallist Cyrille MARET (FRA) who produced a workman like display to defeat losing-semi-finalist PACEK. MARET broke the deadlock with a waza-ari score from a harai-makikomi which was downgraded from an ippon but ultimately settled the contest after five minutes of action. 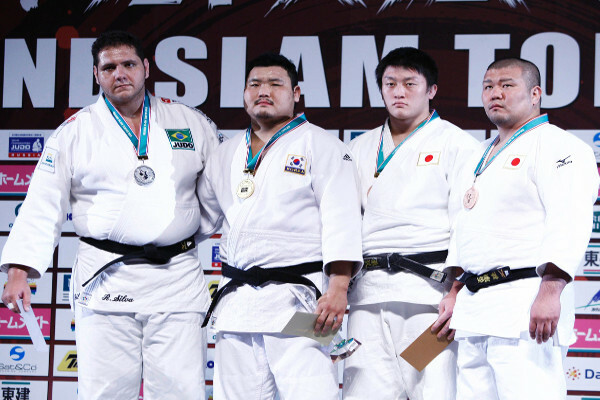 KIM Sung-Min (KOR) won his third Tokyo Grand Slam gold medal at the expense of World Championships silver medallist and top seed Rafael SILVA (BRA) in the last contest of the competition. Both judoka received two shido penalties for passivity in the early stages and, after KIM fell foul to the same indiscretion, he scored a yuko with 30 seconds left by the Brazilian’s momentum against him to counter a harai-makikomi attack by turning Olympic bronze medallist SILVA partially onto his back. KIM saw off All Japan Judo Championships winner SHICHINOHE Ryu (JPN) in the first semi-final by trapping him to the tatami with osaekomi-waza for 17 seconds and a waza-ari score. There was no comeback for SHICHINOHE saw KIM block his best uchi-mata attack. SILVA defeated Kodokan Cup silver medallist MOMOSE Masaru (JPN) in the second semi-final as the 24-year-old was penalised on three occasions with a shido to fall into the repechage. The first bronze medal went to HARASAWA Hisayoshi (JPN) in the battle of Japanese heavyweights as he toiled while a misfiring SHICHINOHE accumulated four shido penalties. The losing-semi-finalist received his first shido for not taking a grip and that was followed by three in quick succession for passivity to lose out by hansoku-make. The second bronze medal was won by Japanese hope MOMOSE who picked up a win against Rijeka Grand Prix silver medallist Jean-Sebastien BONVOISIN (FRA). MOMOSE went ahead with a waza-ari from an uchi-mata and followed up with ippon from a harai-goshi after two minutes.